The Achilles tendon is the largest tendon in your body. It stretches from the bones of your heel to your calf muscles. You can feel it — a springy band of tissue at the back of your ankle and above your heel. It lets you point your toes toward the floor and raise up on your tiptoes. An Achilles tendon injury can happen to anyone, whether you’re an athlete or just going about your everyday life. It’s common for this tendon to get injured. It can be mild or moderate and feel like a burning pain or stiffness in that part of your leg. If the pain is severe, your Achilles tendon may be partly torn or completely ruptured. The Achilles tendon attaches your calf muscles to your heel bone, or calcaneus. You use this tendon to jump, walk, run, and stand on the balls of your feet. Continuous, intense physical activity, such as running and jumping, can cause painful inflammation of the Achilles tendon, known as Achilles tendonitis (or tendinitis). 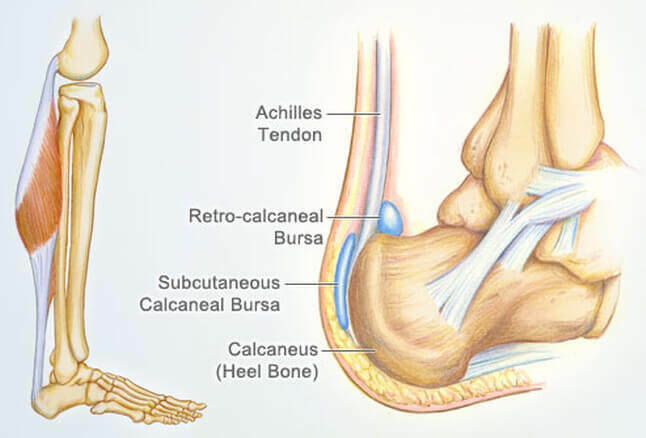 There are two types of Achilles tendonitis: insertional Achilles tendinitis and noninsertional Achilles tendonitis. Insertional Achilles tendonitis affects the lower portion of your tendon where it attaches to your heel bone. Noninsertional Achilles tendonitis involves fibers in the middle portion of the tendon and tends to affect younger people who are active. Achilles tendon tear or rupture. An Achilles tendon also can partially tear or completely tear (rupture) camera.gif. A partial tear may cause mild or no symptoms. But a complete rupture causes pain and sudden loss of strength and movement. These injuries tend to happen when you start moving suddenly as you push off and lift your foot rather than when you land. For instance, a sprinter might get one at the start of a race as he surges off the starting block. The abrupt action can be too much for the tendon to handle. Men over 30 are particularly prone to Achilles tendon injuries. You wear high heels, which can stress the tendon. You have “flat feet,” also called fallen arches. This means that when you take a step, the impact causes the arch of your foot to collapse, stretching the muscles and tendons. Your leg muscles or tendons are too tight. You take medicines called glucocorticoids or antibiotics called fluoroquinolones. The most obvious sign is pain above your heel, especially when you stretch your ankle or stand on your toes. It may be mild and get better or worse over time. If the tendon ruptures, the pain is instant and severe. The area may also feel tender, swollen, and stiff. If your Achilles tendon tears, you may hear a snapping or popping noise when it happens. You could have bruising and swelling, too. You also may have trouble pointing your toes and pushing off your toes when you take a step. Immobilization. Immobilization may involve the use of a cast or removable walking boot to reduce forces through the Achilles tendon and promote healing. Ice. To reduce swelling due to inflammation, apply a bag of ice over a thin towel to the affected area for 20 minutes of each waking hour. Do not put ice directly against the skin. Oral medications. Nonsteroidal anti-inflammatory drugs (NSAIDs), such as ibuprofen, may be helpful in reducing the pain and inflammation in the early stage of the condition. Orthotics. For those with overpronation or gait abnormalities, custom orthotic devices may be prescribed. To diagnose Achilles tendonitis, your doctor will ask you a few questions about the pain and swelling in your heel or calf. Your doctor may ask you to stand on the balls of your feet while they observe your range of motion and flexibility. The doctor also feels around (palpates) the area directly to pinpoint where the pain and swelling are most severe. The most common complication of Achilles tendonitis is pain, having trouble walking or exercising, and your tendon or heel bone becoming deformed. You can also experience a complete tear (rupture) of your Achilles tendon. In this case, you’ll usually need surgery to fix the rupture. One study found that complications such as hematomata (blood swelling and clotting inside tissue) and deep vein thrombosis (blood clot in a deep vein) are possible after a surgery for Achilles tendonitis. Complications can worsen if you don’t follow your doctor’s instructions after an operation. If you continue to put stress or wear on your Achilles tendon after a surgery, your tendon can rupture again. A physical therapist can teach stretching exercises to improve flexibility and increase calf strength. Here are two exercises, suggested by the AAOS. Lean forward with your hands against a wall. Have one foot on the ground, with the leg straight, and one foot in front of it, with the knee bent. Push your hips toward the wall and hold for 10 seconds. Relax and repeat 20 times for each foot. Stand with the front half of your foot on the stair and the heel off, holding a rail to make sure you are balanced and will not fall. Slowly lift your heels and lower them as far as you can. Both exercises must be done slowly and in a controlled manner. Doing them fast can increase the damage. This may help the Achilles tendon to heal and prevent future injury. Physical therapy is normally more effective for noninsertional Achilles tendinitis. Achilles tendinitis cannot be completely prevented, but the risk of developing it can be reduced by being aware of the possible causes and taking precautions. Warming up before exercise can prevent injury. Varying exercise: Alternating between high-impact exercises, such as running, and low-impact exercise, for example, swimming, can reduce stress on the Achilles tendon on some days. Limiting certain exercises: Too much hill running, for example, can put excessive strain on the Achilles tendon. Wearing the correct shoes and replacing them when worn: Shoes that support the arch and protect the heel create less tension in the tendon. Using arch supports inside the shoe: This can help if the shoe is in good condition but does not provide the required arch support. Gradually increasing the intensity of a workout: Achilles tendinitis can occur when the tendon is suddenly put under too much strain, so warming up and increasing the level of activity gradually gives the muscles time to loosen up, and this puts less pressure on the tendon. It is important to stretch and warm up before and after exercising. Stretching helps to keep the Achilles tendon flexible, so there is less chance of tendinitis developing. Stretching every day, including rest days, will further improve flexibility.